Esther Eliza (Farnum) Aldrich was 78 years old in the fall of 1920. She had outlived a husband and two of her six children, living her long life in the farm country of southern Vermont. 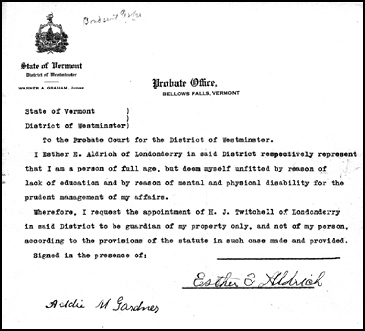 I Esther E. Aldrich of Londonderry … respectfully represent that I am a person of full age, but deem myself unfitted by reason of lack of education and by reason of mental and physical disability for the prudent management of my affairs. Note that a guardian could be (and can be today) appointed for the person or the property. And when — as in Esther’s case — the guardian was appointed for the property only, physical custody of the person wasn’t affected at all. So what this was intended to do was leave Esther living — comfortably and happily, we can hope — in the home of her daughter and son-in-law, while someone else took care of the day-to-day aspects of managing whatever she owned. What we don’t know is exactly why this document was filed. But the document does give us a hint. A hint in the form of the signature of the witness: Addie M. Gardner. Or, to be more precise, Addie M. (Aldrich) Gardner.14 Daughter of David and Esther (Farnum) Aldrich. The daughter Esther wasn’t living with at the time. Now that doesn’t mean there had to have been a dispute between the sisters. It could just as easily have been that neither of them wanted the responsibility of taking care of their mother’s affairs and were happy to have an outsider do it — to spare them from having to answer to their mother. Perhaps the two agreed that Mom shouldn’t be giving her money to, say, one of their brothers. But it’s the kind of clue that warrants looking into. It’s likely Esther, and her children, saw the end coming. And likely that the document reflects an effort to be as prepared for it as they could be in terms of Esther’s assets. So no, silly rabbit, guardians are not just for kids. And Esther’s example reminds us to look at guardianship records in every case… not just where children are involved.